Carefully and effectively cleans the fuel system from all contaminations and improves the operational properties of fuel. It is recommended to introduce the product into regular fuel in order to improve its quality by each fueling. 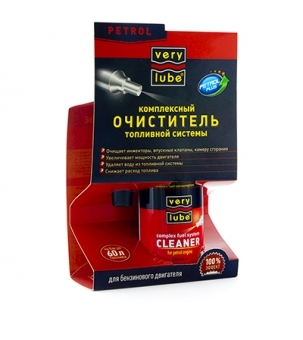 When applied on a regular basis, the cleaner reliably keeps the main parameters of the engine (capacity, acceleration capability, fuel consumption, easy start) on almost new level and provides its properly functioning. Effectively cleans all parts of the fuel system even if it is severely contaminated. Improves the fuel quality up to the Euro 4 standard. Restores the engine capacity to the nominal values. Improves the efficiency of fuel combustion and decreases its consumption. Removes water from the fuel system. Eliminates problems related to the cold start. Similar to branded types of fuel, contains highly effective detergent additives (of the EURO+ standard). Apply by each fueling for a tank up to 60 L of fuel. Effective for all types of fuel delivery systems. In order to achieve the optimal results, apply by each fueling.